Recently A.Prof Tom Hubble and his team received some attention for their research on riverbank collapse on the Lower Murray River in South Australia. During the March 2015 field campaign, ABC South Australia journalist James Hancock interviewed Tom regarding the unusual riverbank failures that occurred at the peak of the Millennium Drought. This interview aired on ABC News Sunday (SA) and ABC Radio, and was summarised in an article titled “Scientists solve mystery surrounding Murray river bank collapse during drought”. Riverbank’s usually fail during high-flow conditions due to erosion and scour of the toe of the bank, or during the recession of flood waters through rapid drawdown. The lower Murray’s banks however, unconventionally failed during extreme low-flow conditions at the peak of the Millennium Drought, when river flows were only 19% of their long-term averaged inflow (the 2008-09 period), and river levels dropped up to 1.5 metres below sea level. 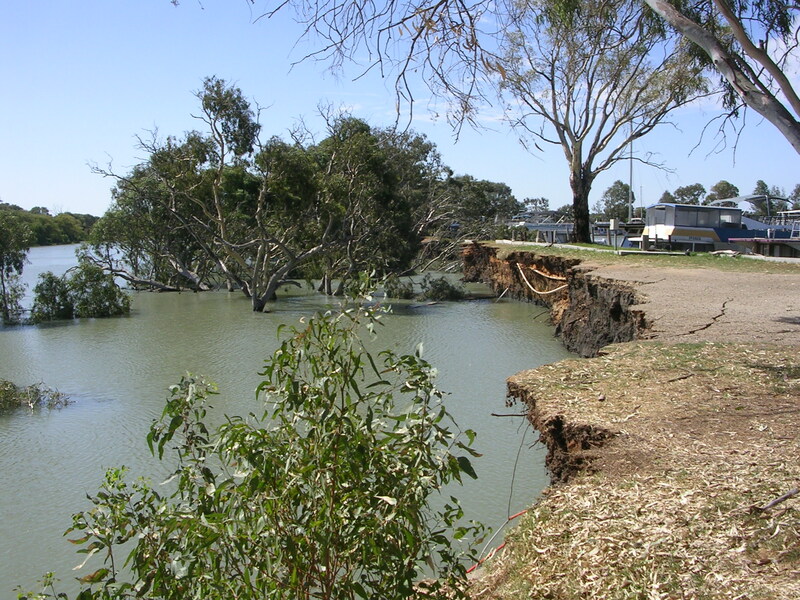 The largest failure occurred at Long Island Marina, Murray Bridge and took with it 3 cars and several deep rooted river red gums (see images inset). A total of 5 progressive failure events led to approximately 300 metres of riverbank collapse. No one was injured during these events, however the risk to river users, property and infrastructure is clearly evident. Details of this research can be found here. Multibeam bathymetry of the failed material after 4 events. The remaining section of bank to the right of the image completed the failure sequence.